Aero Express will buy, sell and trade the 1811D depending on your needs. 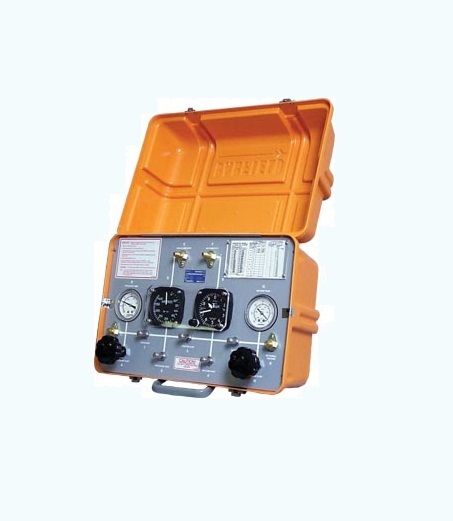 The Barfield 1811D is an inexpensive, portable, self-contained field tester ideal for leak testing aircraft pitot and static systems or on-board testing of altimeters and airspeed indicators. The tester uses two analog instruments (Altimeter and Airspeed) with the appropriate correction cards to perform aircraft leak tests or instrument calibration checks. All 1811 series testers are configured with hand pumps and external pressure ports for supplying the necessary pressure and vacuum (no external power required) needed for on-board testing. The Barfield 1811 series pitot/static testers are very practical for new facilities or those with a limited budget. The unit includes two 25-foot hoses, a pitot mast adapter, and a 2423F static port adapter kit. The 1811D is available with the new DAS650 Digital Airspeed and DALT55 Digital Altimeter. ORDERING EXAMPLE: P/N 1811D103 IS AN 1811D TESTER HAVING A 650 KNOT AIRSPEED INDICATOR AND 50K FT. ALTIMETER. ALSO P/N 1811DA0A IS AN 1811D TESTER CONTAINING DAS650 AND DALT55 DIGITAL INSTRUMENTS. Express Calibration is an Authorized ISO-17025 Calibration and Repair shop for the Barfield 1811D. Visit www.expresscal.com for full capabilities.